Whether you are three dates in and still trying to make it seem like you are fun and interesting, or three years in and trying to break out of your take out and documentary routine (why are there so many World War II documentaries?! ), there are a million reasons to get out of the “dinner and movie” date routine. The trouble starts when you try to come up with an idea for a new and exciting date idea and can’t come up with a single one. That’s where we come in, making fun possible in every part of your life. Here are 5 date ideas that help you level up. If you take our advice and hit any of these up for your next #datenight, don’t forget to share us in the fun by tagging #FrayLife in your social posts! It’s not what it sounds like, we swear! Go retro with some classic arcade games (Mrs. Pac Man! 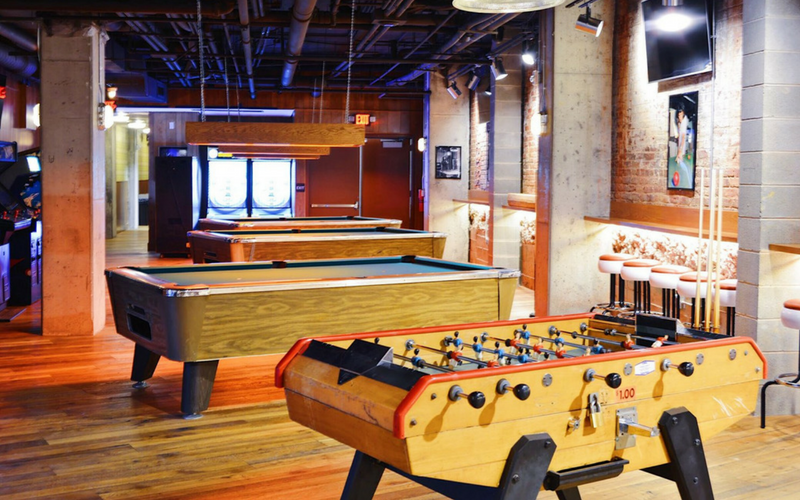 ), pool, foosball, and skeeball. You and your date can flash back to the fun of your youth and game all night, but enjoy the perks of adulthood with the specialty cocktails, craft beer, and most importantly, Shake Shack. Great for breaking the routine and actually DOING something fun. Plus, you get to see each other in a whole new light (Who knew anyone had such strong feelings about what color foosball team they wanted to be? Too much World Cup). Fingers crossed you guys are a compatible level of competitive! #FrayLife Tip: Losers can be soothed with milkshakes. Winners can also celebrate with milkshakes. 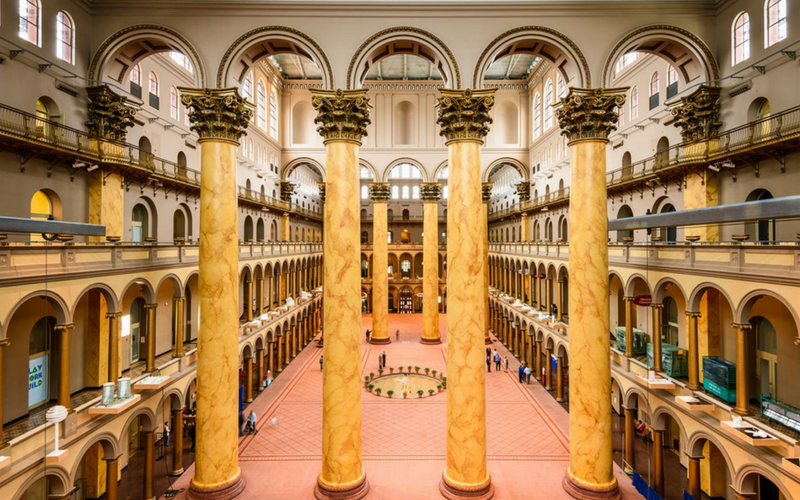 As a city, we have been sleeping on the National Building Museum since the summer of the ball exhibit when a photo there was everyone’s dating profile picture. Consistently excellent, the National Building Museum just opened their new exhibit, Fun House (designed by Snarkitecture, who wins at naming things), which includes interactive rooms and that are a super artsy take on summer block parties. It looks amazing, will be very Instagrammable, and is air-conditioned. You’re welcome. Wind down after the exhibit over at Denson Liquor Bar, a great cocktail bar with a speakeasy vibe and flattering lighting. 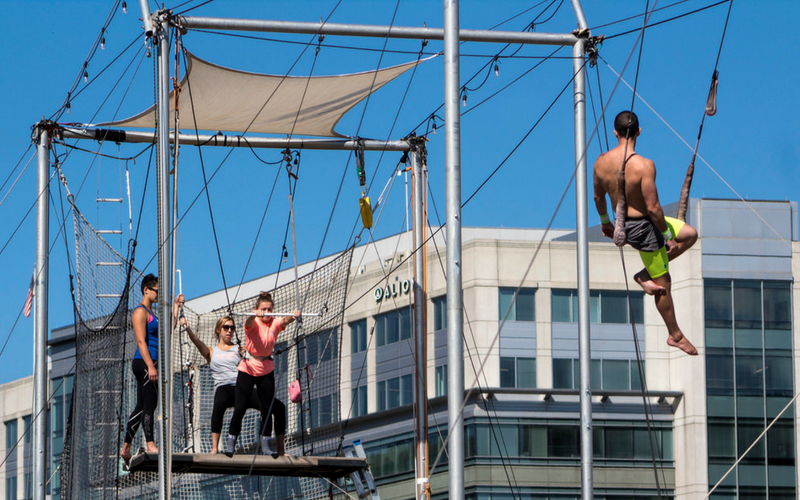 Chances are that neither you nor your date is circus folk and Y’all have never trapezed before. What a perfect opportunity to try something new, learn a new skill, support each other as you try (and maybe fail) at something new and scary. It’s active, forces you out of your head, and is a little crazy, a power combo for dating. Decompress after with a beer over at Bluejacket or eat your feelings at Ice Cream Jubilee. #FrayLife Tip: DO NOT drink before trapezing. 1. they won’t let you, and 2. use your noggin to know that is very clearly a bad idea. Baseball is what everyone does, be an original and suggest tennis! First, it’s Serena’s world and we are just living in it, so accept that tennis is a super fun sport to watch. Second, it’s in the George Washington University’s Smith Center, so it will most likely be a better temperature than outside (Take that, baseball!). Third, there are some big tennis names coming through the Kastle’s, include Venus Williams and Naomi Osaka. This is an awesome chance to see them in real life and then you can seem super cool chatting about them around the water cooler during the US Open. After you watch world-class athletes showcase their skill, grab a craft beer and some delicious Tater Tots over at Tonic. 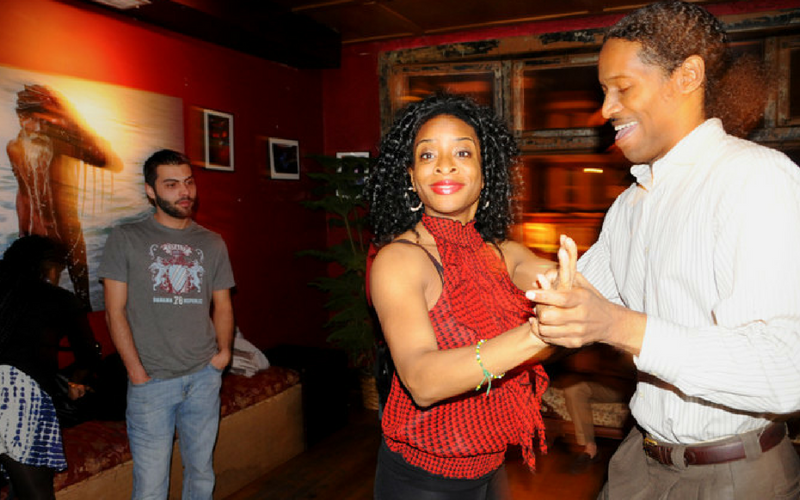 Bossa Bistro up in Adams Morgan has drop-in Salsa Lessons. Take a break from Netflix and pop over for a fun evening with your boo, trying to make your hips do a figure eight on beat with the music without looking at your feet. It’s awkward, it’s fun, it’s flirty, just the way dating should be. So have a glass of wine, loosen up, and make like Shakira with hips that don’t lie. #FrayLife Tip: Learn how to salsa and then use what you learn! Dress like that dancing emoji woman and hit the town to showcase those new #skillz. It’s a great bonding experience and you get to dance up on bae. Win-win. So pull out your planner (aka phone – do people still use planners?) and start filling it with awesome experiences with a person you really dig! Can’t get enough creative dating options? Here are 6 fun activities perfect for DOUBLE dating. Uncovering the coolest things to do in DC. Discover the best in food & drink, events, attractions, and can’t miss activities. Join the #FrayLife and start making fun possible.